Mandarin classes start from the 4th June for 6 weeks, 18:30 – 19:30, £3 per session. 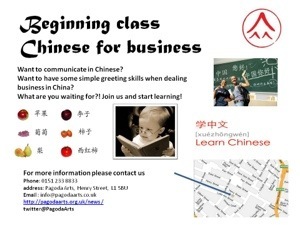 Need to refresh you Chinese language skill? Or learn from scratch? Come and join us. For more information, please contact: email: info@pagodaarts.org.uk or call: 01512338833.